Why do you worry for anything? Why are you afraid of anything? Who can kill you? Soul neither takes birth nor dies. Whatever has happened, was good, whatever is happening, is good, whatever will happen, is good. You shouldn’t repent on the past, Don’t worry for the future, present is going on. What have you lost, so you are weeping. What did you bring along with you, which you’ve lost. What did you generate, which has perished. You did not bring anything, whatever you got, was from here (this world) only. Whatever you gave, you gave here only (in this world) whatever you took, and you took from him (God) only. Whatever you gave, you gave to him (God) only. You came empty – handed and will leave empty-handed. Whatever you have today, was of someone else yesterday, and will be of someone else tomorrow, and of someone else day-after-tomorrow. You are getting delighted & happy considering it as your own and this happiness of yours is the real cause of your sorrows and unhappiness. Changes is the principal of this world. Whatever is your thinking about death is the actual life. In a moment you become popper (begger). Mine-your’s, Small Big, Our own or other etc. should be removed from the mind, than you’ll find that everything / everyone is yours and you are of everyone / everything. Neither this body belongs to you, nor do you belong to this body. This is made of Fire, Water, Air, Earth and Sky and all will (Vanish) mix in the same. But soul is stationery, so who are you? You must submit yourself to almighty god. This is the best support. Who so ever can realize the importance of this support (God), then he is free the Fear, Worry, Sorrow, etc. and gets rid of the same. Whatever you do, offer it to the service of God. By doing so, you’ll enjoy the freedom of life. 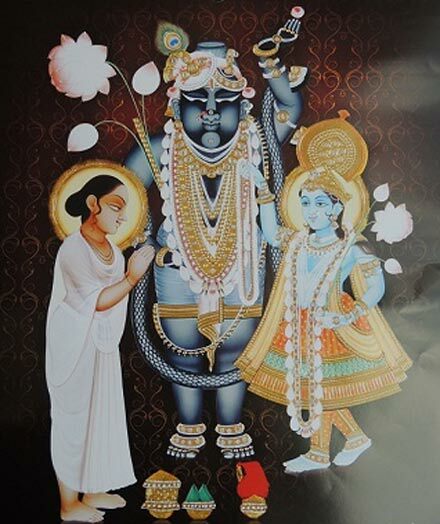 Whenever you are happy then you offer Manorath to God but whenever you make a Vaishnav happy then God offers you a Manorath, Because Shrinathji feels delighted.